New polling from Gallup shows that the percentage of uninsured Americans inched up last year, but there’s no evidence yet that Connecticut is following that national trend. There was a dip in the latest enrollment in Access Heath CT, Connecticut’s Affordable Care Act health insurance marketplace. But there was also an increase in the overall number of Connecticut residents who signed up for Medicaid, known as HUSKY in the state. Total enrollment through Access Health CT for a 2019 policy was 111,066 households, about 3,000 fewer than the 2018 enrollment. Andrea Ravitz, marketing director for Access Health CT said it is too early to tell whether the uninsured rate in Connecticut – or the rest of the nation – is rising. “I believe that nationwide it went up, but it’s too soon to tell,” Ravitz said. Access Health’s enrollment period for a 2019 health insurance policy ended on Jan. 15, but several other states, including New York, that have their own exchanges have not ended their enrollment periods. However, preliminary figures from the 39 states that use the federal exchange to enroll their residents in health insurance show participation has dropped. The Centers for Medicare & Medicaid Services said about 8.5 million people enrolled in ACA coverage, compared to 8.8 million a year ago through the federal exchange. Meanwhile, Gallup estimated the uninsured rate for adults in the United States increased by 1.3 percentage points – or about 3 million Americans – last year and 2.8 percent since the third quarter of 2016. Those living in the South had the sharpest rise in the number of uninsured, while those living along the Eastern seaboard were the least affected. Women, those living in households with annual incomes of less than $48,000 per year, and young adults under the age of 35 reported the greatest increases, Gallup found. That means the adult uninsured rate is at the highest level since the first quarter of 2014, when the ACA’s major coverage expansion went into effect. 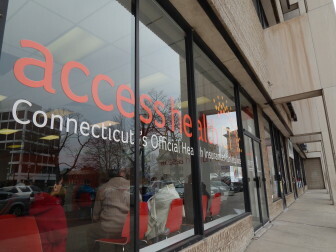 Still, Ravitz said she is pleased with the Access Health CT enrollment numbers. “The moral of the story is that we’re happy with enrollment,” she said. A little more than half of those who enrolled in a health plan through the marketplace had premium increases of $100 or more. But the premium increases imposed by Anthem and ConnectiCare, the two insurers who sell policies on the ACA marketplace, were much smaller than those of some previous years. And about 71 percent of those who purchased a policy through Access Health CT were eligible for federal subsidies that helped bring down the cost of coverage. Analysts say efforts to degrade – and even repeal — the ACA by the Trump administration and congressional Republicans hurt health insurance enrollment this year. For example, in a massive tax code overhaul, Congress eliminated the “individual mandate,” which are the tax penalties levied on those who did not purchase insurance. The repeal of the individual mandate, and the decision by a Texas federal court that, without the mandate, the entire ACA is unconstitutional, “created a lot of confusion,” Ravitz said. The Texas federal court decision has been appealed to the 5th Circuit Court of Appeals and whatever those judges decide will likely be appealed to the Supreme Court, embroiling the ACA in court battles for years. Meanwhile, the Connecticut Department of Social Services says enrollment in Medicaid, or HUSKY, rose last year and is now at 842,548 individuals, including 265,565 in the ACA’s Medicaid expansion portion. In December 2017, DSS said it served a total of 821,457 individuals enrolled in Medicaid, including 244,215 in the Medicaid expansion. “Definitely, our enrollment has gradually and steadily increased since we began Medicaid expansion in mid-2010,” said DSS spokesman David Dearborn.